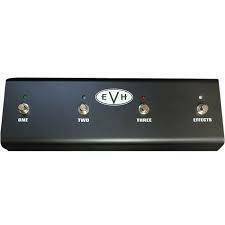 Loaded with pure EVH sound and power, the new EVH 5150 III 50-Watt Head is a scaled-down version of its acclaimed 100-watt big brother. Its smaller size and portability make it a perfect amp for players who want arena volume, tone and performance in a compact package. This is a three-channel amp, channels one and two share EQ with gain, low, mid, high and volume controls. Channel three has gain, low, mid, high, volume and master presence and resonance controls. Other features include selectable impedance 4, 8 or 16 ohms with dual parallel speaker output jacks, effects loop, headphone jack, line out and black hardware. Included is a four-button footswitch that has a 1/4 input jack and also accommodates MIDI footswitching. This amp has ivory textured vinyl covering with a black EVH-striped grille. SO this amp rocks period. The only reason I did not give it a perfect score is cause of two things in the tone section of the amp. One being the presence is shared by all three channels. Second issue is that channels one and two share the 3 band eq as well. I do find the amp get really noisy when cranking up the insane gain preamp. Yea the preamp has a insane amount of gain, These is no need for any dirty pedals when using channel three thats for sure. I use this running at the same time as mu JCM 2000 Marshall. Usually just running both heads in to a Marshall 1960 bottom cab running in stereo though a Radial AB Y.
I had a Peavey 5150 for about a year. I changed tubes again and again, got a bias mod, tried different speaker, cables, guitars, pickups, everything to make it sound better. Every time I played I had this sharp spiky distortion that was brutal, but so raw. The EVH 5150III is smoother, saturated to the max, clearer, thicker, and generally more pleasant sounding than the 5150. Every guitar I try sounds awesome; does not matter if it's a $1700 Explorer with a Bareknuckle Juggernaut or a $200 LTD. Always sounds awesome. This amp is a total monster. Great clean and crunch but if you want high gain for metal chugging this is definitely your amp. With the gain knob at 11:00 on the red channel you have more saturation than you could possibly need and with great articulation and no flab or fizz (more gain at 11:00 than a Dual Rec. at 1:30 + Tube Screamer!). But there's more past 11:00 if you want it. They say it goes well with the EVH cab and I'm sure it does, but it sounds huge in my Mesa Rectifier 2x12 with V30.